THE rumpus over Cape Town artist Brett Murray’s painting, The Spear, depicting a Jacob Zuma lookalike in the triumphal pose of Vladimir Ilyich Lenin with a set of male genitalia attached would be laughable if it weren’t for the very serious implications behind it. In a week during which anti-democratic behaviour came to the fore when members of Cosatu, with the public approval of some of the movement’s leaders, attacked Democratic Alliance protesters, the reaction of the ANC and Zuma himself has been further evidence of a disturbing drift towards authoritarian tendencies. 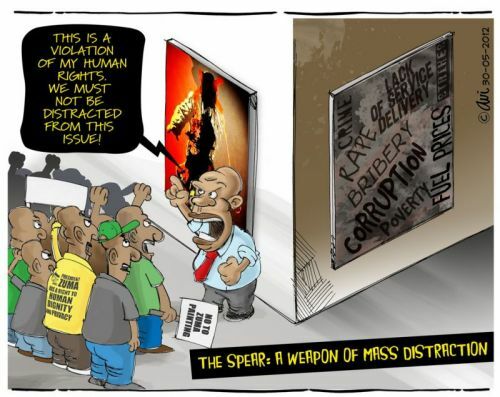 President Zuma himself said in an affidavit served on City Press on Friday night that he was “shocked, and felt personally offended and violated” and that the painting depicts him as “a philanderer, a womaniser and one with no respect”. With all due respect to President Zuma, and without wanting to pre-empt the findings of the South Gauteng High Court in tomorrow’s hearing, we would suggest to the president that this is not a useful line of argument. Almost as shocking as Radebe’s reaction was that of Arts and Culture Minister Paul Mashatile, who was quoted in City Press as saying that “if an artwork doesn’t respect reconciliation, it doesn’t contribute to nation-building. We can’t have a situation where we are insulting each other every day” – a rather strange interpretation of art for the man whose ministry is tasked with overseeing the arts in South Africa. The whole row would be really silly if it weren’t so sinister. It’s only art, for heaven’s sake.